Wow! Helen Mirren has given a masterclass in how to look svelte, classy and yet still very modern – all while showing barely any skin! The film star ensured all eyes were on her as she attended the 45th Chaplin Award Gala held to honour her glittering career. And 72-year-old looked every bit the ‘queen’ of the gathering she when he hit the red carpet with her husband Taylor Hackford, 73, in New York on Monday night. Mirren’s dress, which nipped her in at the waist before billowing out into a full-length skirt, featured a simple design of poppies and blue flowers on slimming black background – a striking pattern that looked eye-catching without being busy in the way a more traditional floral fabric would’ve been. The square neckline made the most of one of Mirren’s best features – her smooth decolletage – while the slim-fitting, past-the-elbow sleeves took care of any worries about wobbly upper-arms. She completed the ensemble with a thin black choker that gave the whole look a showgirl feel, a small red clutch and black peep-toe heels, with her silver locks pulled back in loose waves and her makeup classic with black liner and red lips. 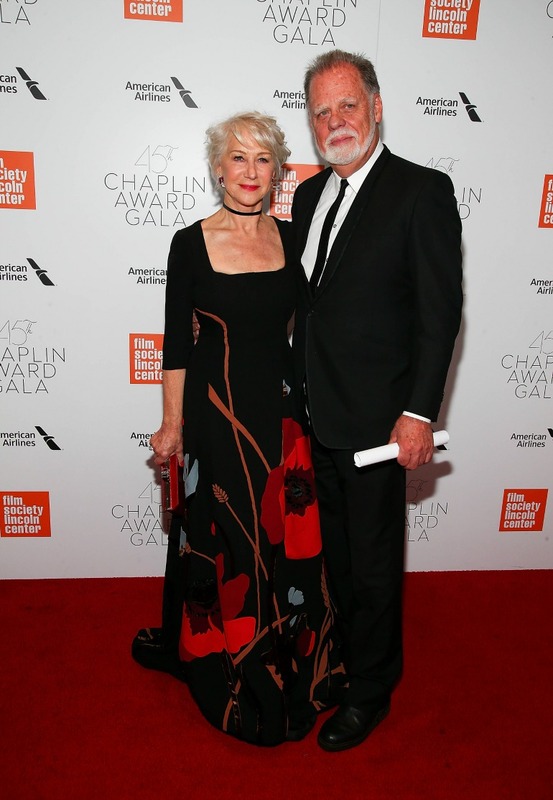 In all, Mirren looked beautifully dressed but not even slightly OTT. So it’s no surprise that her director husband, who she has been married to since 1997, couldn’t have looked prouder as he wrapped his arm around Mirren on the red carpet. 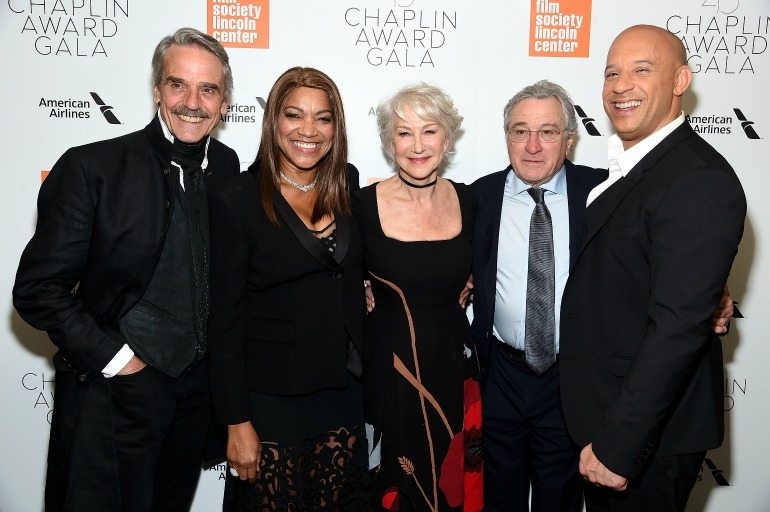 The annual Chaplin award event, which was attended by stars including Jeremy Irons and Robert De Niro, featured movie and interview clips documenting Mirren’s five-decade career. Though she makes dressing up look effortless, Mirren revealed that she does have a bit of cosmetic help, which she reckons makes her look a lot better than she otherwise would. The actress recently had her eyebrows tattooed and now swears by the procedure. What do you think of this look? Would you wear it, or do you prefer something more elaborate?